Yun Song has established herself in China as one of the most prominent Erhu performers of her generation. Her extraordinary musical gifts became apparent when, at age 17, she received the First Prize from the Traditional Music Grand Prix organized/hosted by the Ministry of Culture, China. With her brilliant technique and real emotional depth, she won numerous awards, including Erhu solo, Concerto Competitions in Beijing, and nation-wide TV annual strings performing competitions in the following years. And she became one of the most sought-after young Erhu artists, appearing from city to city. Yun Song received her formal training with professor Mingyuan Liu, who is a string master himself, at China Conservatory of Music, Beijing, the most prestigious music academy in China. Her teachers also included professor Yi Wang, cellists, Boyong Xiao and Hui-fen Min, and Professor Yue Zhang. 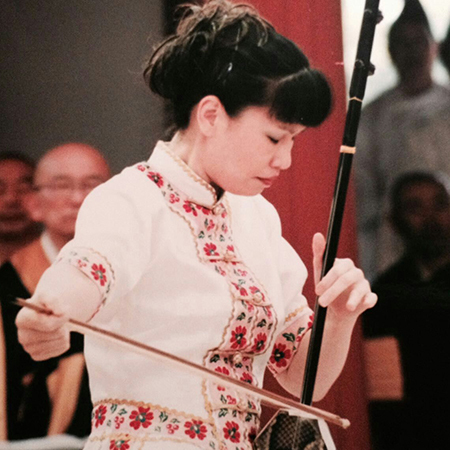 As a student Erhu soloist, She has been invited to represent China’s Young Musicians to participate in festivals and concerts around the world, including Hong Kong, Macao, Taiwan, Japan, and Finland. At the performance taking place in Helsinki, Finland, “the moon” she played as Erhu soloist was so touched that it moved a music professor to tears. After that, she joined the Central National Song and Dance Troupe as a Erhu soloist and performed frequently. And, as well, she became the member of China Musicians Association, and the Director of Chinese Erhu Artists Association. Yun Song is widely regarded as one of the most talented Erhu artist. She published music album “deciduous” in Hong Kong. One of her music pieces “ The Memory of Qin e” has been included in the China’s music schools’ curriculum. As a cultural exchange scholar, Yun Song participated music performing programs in Japan. Her brilliant performance as soloist really impressed the Japanese audience and Mr. Suzuki Jio, the well known Director of Gagaku Orchestra in Tokyo. After that, she was invited to join the orchestra as the guest Erhu soloist. During her stay in Japan, Victory record company, the biggest in the business, published music CDs, featuring 300 Japanese folk music pieces played by Yun Song with Erhu. The music recordings were so popular in Japan and have been widely praised as well.